Yesterday? will go down in history as the date that I skied for the very first time – when I win Olympic Gold, these pictures will be in the news, you know in a feature story or whatever – so you can all say you knew me when! 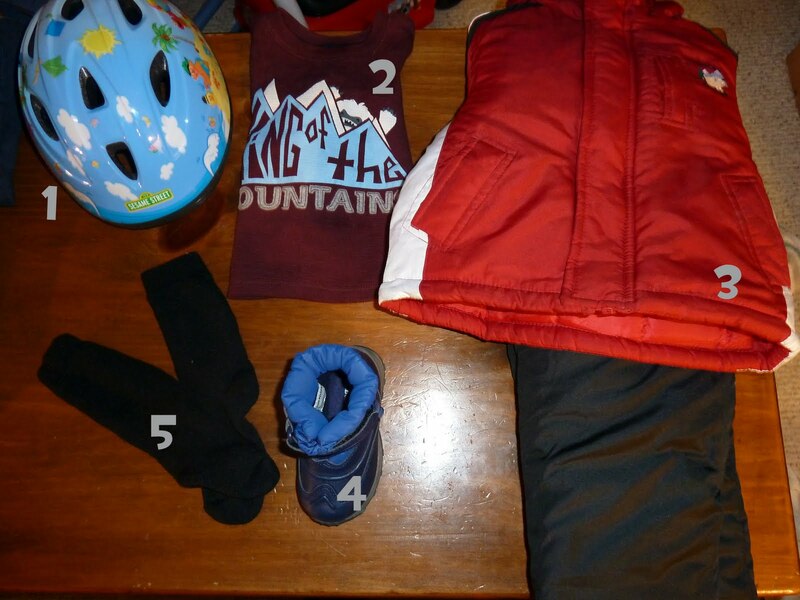 It was unseasonably warm yesterday – it was about 50 degrees, which means Mommy severely overestimated the amount of layers I’d need when she packed my ski bag. 1. My Sesame Street helmet – you guys? I totally love my special hat. I literally wander around the house with it on occasionally. 3. 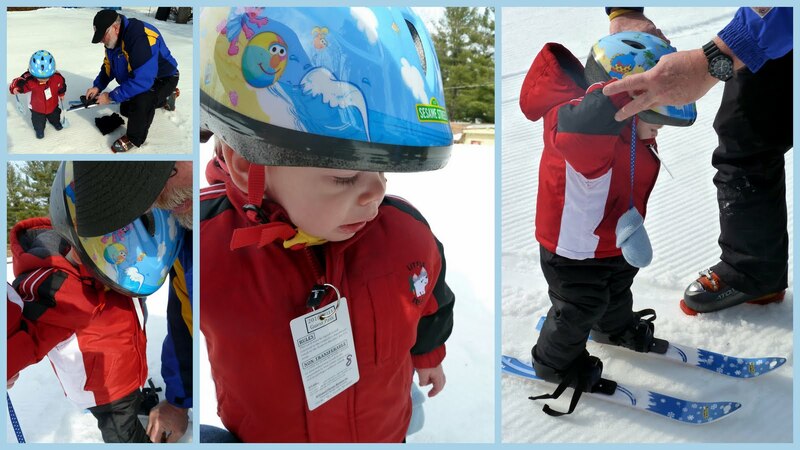 My jacket and snowpants – which Daddy got on end of season clearance sale for $16! 5. Ski socks – These are the tiniest ski socks Mommy has ever seen, but they’re still giant on me. They were thigh high! 1. My penguin hat – I probably *could* have fit this under my helmet, but it wouldn’t have been easy… and I would have died of the heat! 2. 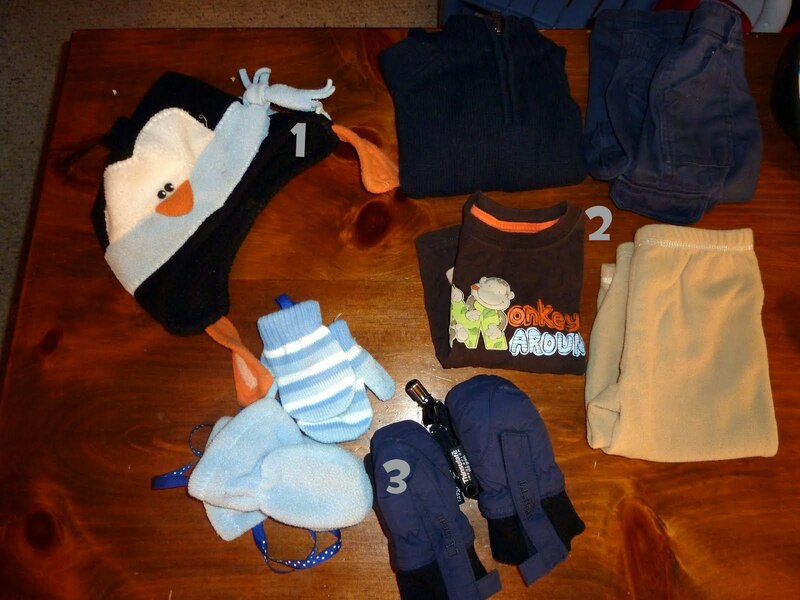 Tons of layers – light cotton pants, fleece pants, a long sleeve tee, AND a sweater? Totally unnecessary. 3. THREE pairs of mittens – Actually, looking back at the pictures, I *did* wear one of the pairs for a little while, but mostly they dangled from my wrists as usual. I don’t like mittens – and why on earth would I need 3 pairs?! So. I was clearly ready to go. Are you ready, by the way? Because there are a TON of pictures here – and a video as a bonus for those of you who stick with me until the end! First, Coach helped me put on my skis. I was not really super-thrilled. I like to run, and you know what? You can’t really run in skis. 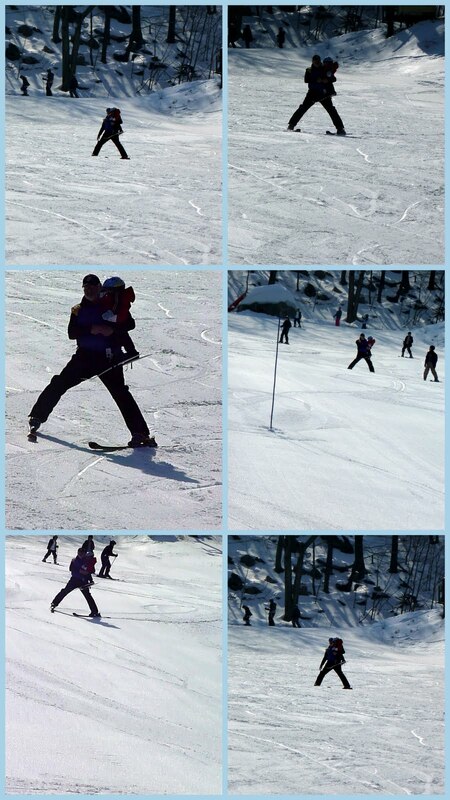 Then, Coach showed me how to duck walk up the hill a little way and skied down with me a few times. Mommy’s guessing Coach might be a little sore this morning. And then? We stopped fooling around and got to ride the ski lift! … and headed back to the lift line! 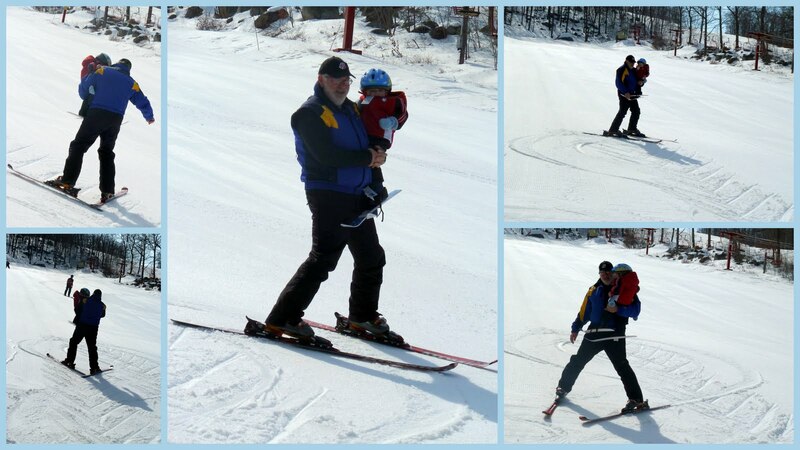 While Coach carried me most of the time, my skis *did* hit the snow – here is my first ever ski run! Thanks for taking me to the mountain, Coach! I hope we find my boot because my ice skates strap over them and we haven’t made it to the rink yet! OMG I just DIED from the cute! DIED!!!!! And Coach? He is obviously super duper talented (I'm happy I make it down the hill carrying my own body weight LOL) and omg he's gonna be sore today!!! Looks like a blast. Hope you find the other boot! that is AWESOME!!! what a brave little guy! He's so cute!!! I'm your newest follower. What gorgeous photos. And a brave little soldier too! Following you after finding you through Sunday blog hops.